Then he showed me a river of the water of life, clear as crystal, coming from the throne of God and of the Lamb, and flowing down the middle of the great street. On either side of the river grew the tree of life, bearing twelve kinds of fruit, yielding its fruit every month. The leaves of the tree were for the healing of the nations. There will no longer be any curse, and the throne of God and of the Lamb will be in it. His bond-servants will serve Him. They will see his face, and his name will be on their foreheads. And there will no longer be any night. They will not have need of the light of a lamp nor the light of the sun, because the Lord God will illumine them, and they will reign forever and ever. The Lord, the God of the spirits of the prophets, sent his angel to show to his bond-servants the things which must soon take place. (Revelation 22:1-6 my own paraphrase). As we continue on in the passage, we read this: “The nations will walk by its light [speaking of the light of the New Jerusalem], and the kings of the earth will bring their glory into it. In the daytime (for there will be no night there) its gates will never be closed” (Revelation 21:23-25 NAS). We learned earlier that the gates are made of a single pearl, but apparently the pearls are for adornment only, since they are never rolled in front of the gate entrance (or whatever other method would be used for closing the gates). The fear of thieves or lack of security is never in question in the New Jerusalem, so the gates remain open always. With this sentence, John brings up another subject about not only the New Jerusalem, but the entire New Earth. He speaks here of the nations. Who are these people and are they inhabitants of the New Jerusalem? Of course, we have no answers that are certain, but does not the existence of these people of the nations bring up several interesting questions? The very first thing that John said about the city the New Jerusalem when he first saw it was that it shown with a great brilliance. Then, after writing about some of the other aspects of the city as we have read, he now returns to that theme of the light of New Jerusalem. John writes, “The city has no need of the sun or of the moon to shine on it, for the glory of God has illumined it, and its lamp is the Lamb” (Revelation 21:23 NAS). The verses in this section have led to a few people teaching some misconceptions about eternity. The first of these misunderstanding concerns questions about the sun and the moon. Because of what John said, some people teach that there will be no sun or moon at all in the new creation. I will get to that point in a moment. First however, I would like to mention another misunderstanding that some people have about this section. This misconception is that John is speaking merely in a figurative manner, and that the subject at hand is not actually speaking of a physical light at all. The thinking concerning this is that since John was living in the day before artificial lighting for the streets of cities, when darkness came, people usually went nowhere. In those days and in those places, with darkness came insecurity. That is why the cities of his time had walls with gates that they closed at night. The people did not want invaders to have the chance to enter their cities under the cloak of darkness. Families also closed themselves inside their own homes. In those types of environments, there is a special feeling of sequestering and even shielding oneself in protection. About forty-five years ago, I lived in a village such as this in a rural area of India. It was not such a small village. If I recall correctly, it had a population of about 50,000 people. We did have electricity in the village, but it came on only occasionally during the day. Usually, shortly after dark, it was always shut off. There were no streetlights, so the village lay in complete darkness at night except for whatever light might be coming from the moon and the stars and from the oil lamps inside of the dwellings. When darkness began to fall, everyone knew that they should be getting home because soon the electricity would be off, and no one wanted to be out in the streets at night. It was not that it was particularly dangerous in that village. Certainly, I never felt insecure there, but it was just very disorientating to be out wandering the little pathways in the darkness. After it became dark, everybody just stayed in their homes, or perhaps visited in a neighbor’s house. Anders Johansson was on a journey in the late 1800s. 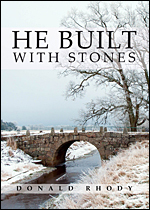 Anders was a young stonecutter from Sweden, a stone mason. Coming from a childhood of sorrow and of uncertainty, he picked up the craft of stonecutting and worked to perfect it so that he could become secure in his life. His journey to achieve security led him to various parts of Sweden, and finally overseas. At the end of his travels, however, Anders discovers something even more satisfying than the security that he had worked so hard to achieve. He also discovers something about himself, and comes to realize an entirely unexpected goal.